We eat a lot of bread in our house. Yes, I bake some of it, but not nearly all of it. I’m still buying bagels and sandwich bread nearly every week. The problem is, I haven’t gotten into a good bread baking routine. The adults like crusty European style bread; the kids like softer American style, at least for their lunchbox sandwiches. 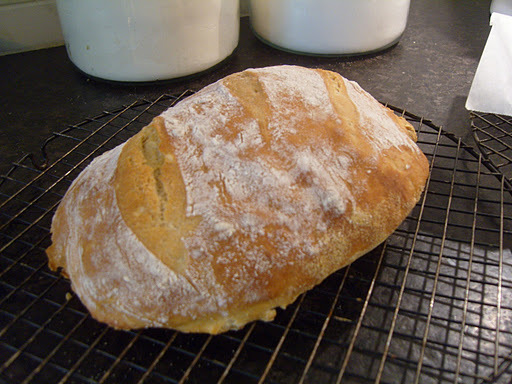 I am a convert to no-knead bread, thanks to my cousin Betsy’s recommendation of Artisan Bread in Five Minutes a Day. I can’t say enough good things about this book, and the lovely authors who maintain their own blog and are willing to answer all your questions! I have not nearly baked my way through the book yet, but I hope to. 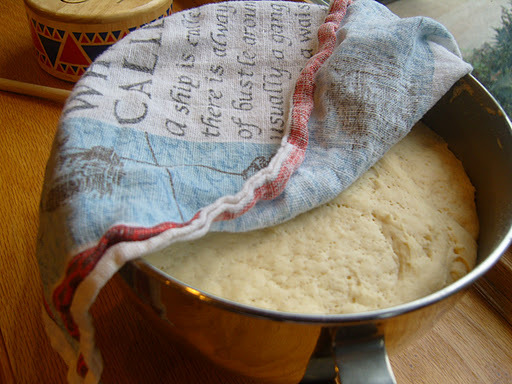 Keep the dough in your fridge, and you can have fresh bread or pizza every day. My other go-to baking book is the King Arthur Flour 200th Anniversary Cookbook. Thank you, Steve and Elaine, for giving us this book however many years ago! It has several master recipes, and then spends several pages explaining how each ingredient works and how you can vary them. My book falls open to the buttermilk pancake recipe, which I make almost once a week, and the kids often eat the leftovers (which are great reheated, unlike pancake mix pancakes) during the week. I also love their muffin recipes. Did you know that if you preheat your oven really high (500), and then turn it down to 400-ish when you put in the muffins, you will get muffins with big domed tops? (That is, if you follow the other Cardinal Rule of Muffins: Thou shalt not mix the batter for more than 20 seconds.) I promise to share the banana chocolate chip muffin recipe that I’ve perfected using the King Arthur basic recipe. It’s pretty healthy (whole wheat flour, not much sugar, lots of fiber), but if you drop some chocolate chips in it, the kids will eat it! For cakes, I go everywhere. I first started baking wedding cakes from The Wedding Cake Book by Dede Wilson. I also use Rose Levy Beranbaum’s The Cake Bible and The Gourmet Cookbook. I can usually find a cake recipe for any special occasion from one of those books. For cupcakes, I keep returning to a great recipe for vanilla cupcakes from the magazine Cook’s Country. It makes two dozen moist and buttery cupcakes–perfect for a birthday party. And lately, as I’ve mentioned before, the first place I search for new recipes (or better versions of old favorites) is Smitten Kitchen. I’m thinking about making this cake for a birthday gathering for a very special aunt next month. What’s your favorite baking book or resource? Please share in the comments! The best recipes always come from personal recommendations! You're welcome! Thanks for the mention in the blog, too! I like Rose Levy Beranbaum's Christmas cookie book. The recipe for butter cookies is so fantastic. The dough can withstand kid rolling out and cutting and still look and taste great! The Ginger pennies are awesome too. Great book, now I'm hungry! PS, how the heck did you slice that bread?! Becky, bread slicing is always a challenge! Usually when I make white sandwich bread, it tends to crumble when I slice it. I baked that loaf on Sunday, when I was home to let it rise three times (like I would for dinner rolls, where you want a finer texture)–twice in the bowl and once in the loaf pan. Then I rubbed the top with butter while it was still warm, which kept the top soft instead of crackly. It sliced really well (I just use my big serrated bread knife), for the first time! 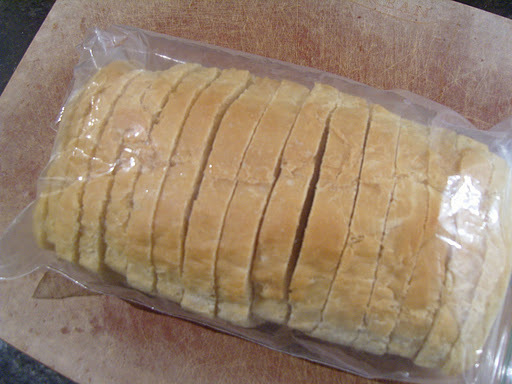 The bread was pretty good, too, but the kids would like it EVEN SOFTER. Next I'm going to try adding in some egg and milk. I'll report back! And I'll have to try the butter cookies! I really like the Mississippi Mud Cake in New Recipes From Moosewood Restaurant.